Everybody loves the sunshine, and we've had a lot of it recently. Better still, the heatwave has raised the temperature of bingo promotions. This July, Mecca bingo are offering you the chance to play for a share of an enormous £1,000,000 prize pot. Depositing and spending just £30 in Emoji or Burst bingo from Monday-Sunday. Gaining access to free bingo in The Mecca Bingo Room from 8pm-10pm on Sundays only. The final game carries a prize of £500, which is an ideal way to end anyone's week. Remember, this promotion runs until July 29th, during which you can get your bingo and sunbathing fix. There's no need to opt-in either, just head over to Mecca bingo, make your deposit and get playing. Offers don't come more sizzing hot. You must be a resident of England, Scotland or Wales, as well as 18+, to take part. The promotion commences at midnight on Monday July 2 and ends at 23.59 Sunday July 29. 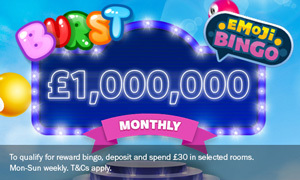 Spend £30 cash on meccabingo.com from midnight Monday to 18.00 Sunday to qualify for a free bingo session. The free session will take place in the Mecca bingo room on Sunday, 20.00-22.00 GMT. Qualification is based on cash stakes only. Bonus funds do not count towards qualification.